At least 20 Democrats mounting bids for the House of Representatives in November have publicly said they won't support Rep. Nancy Pelosi (D., Calif.) for Speaker of the House. Pelosi, the current House Minority Leader, was the first female Speaker in history from 2007 to 2011, but she hasn't been able to lead the Democrats back into the majority since Republicans took back the chamber in the 2010 midterms. She's bullish about Democratic Party chances in 2018, however, confidently saying last month, "We will win. I will run for Speaker." However, should her party win the majority, she will have to deal with the possibility of a flood of freshmen Democratic congressmen who have promised not to back her, Politico reports. Pelosi is one of the country's most unpopular politicians and has proved an effective bogeyman for Republicans to hang around Democrats in local races. Democrat Clarke Tucker, who is running in Arkansas' 2nd District, used his first general election ad to attack Rep. French Hill (R.) for saying he would support Pelosi. "Congressman Hill opened his campaign by attacking me, knowing full well that I've said from Day One that I won't vote for Nancy Pelosi," he said. "We're better than that." Rep. Conor Lamb (D., Penn.) said he would not vote for Pelosi during his successful campaign in a special Pennsylvania House election. Lamb flipped a district previously held by a Republican that went overwhelmingly for President Donald Trump in 2016. The sentiments against Pelosi could imperil her bid to again take the gavel if Democrats win back the majority but she loses too many votes to get the requisite 218-vote majority she needs. Many of them are in key swing districts Democrats must win in order to win back the House. Politico reported, "Of the more than a dozen Democratic candidates who have survived their primaries and rejected Pelosi, most are in districts that top the list of targeted 2018 seats." Candidates opposing Pelosi include Anthony Brindisi in New York's 22nd District ("I believe it's time for new leadership on both sides of the aisle"), Mikie Sherrill in New Jersey's 11th ("I won’t be supporting Nancy Pelosi for leadership"), Gil Cisneros in California's 39th ("While I respect Representative Pelosi’s years of advocacy on behalf of California and the Democratic party, new leadership is needed"), and Dan McCready in North Carolina's 9th ("I’ve said since Day One that I wouldn’t vote for Nancy Pelosi as speaker"). Numerous Democrats still facing primary fights to get the nomination have also said they won't support her. 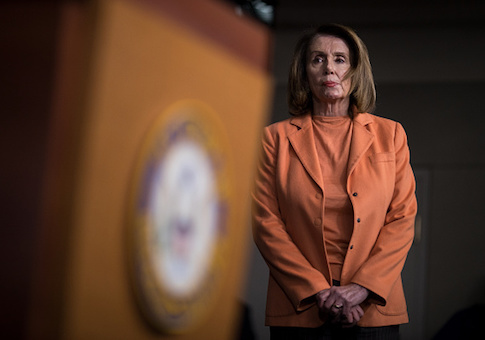 Pelosi has also met opposition from current Democratic office-holders, like Reps. Kathleen Rice (D., N.Y.), Filmon Vela (D., Texas), Brian Higgins (D., N.Y.), and Tim Ryan (D., Ohio), who launched a failed bid against Pelosi for Minority Leader in the aftermath of the 2016 election. "Whether you are someone who has been here a long time, a short time or a candidate running for office for the first time, people are being more vocal about how they feel about leadership of the party," Rice said. Vela remarked last year there was "no way in hell" Democrats could win the majority with Pelosi in leadership. Higgins said last week Pelosi was "aloof, frenetic and misguided," and he wouldn't support her either. An anonymous Democratic pollster told Politico Pelosi was generally the party's biggest vulnerability this fall. "With very few exceptions, the biggest hurdle, the biggest vulnerability for Democratic candidates is Nancy Pelosi, and the strongest card the Republicans can play is attaching a candidate to Pelosi," the pollster said. Pelosi spokesman Drew Hammill sounded like her boss in asserting she would have the caucus's support. Pelosi has defended herself as a "master legislator" and a "politically astute leader." "Leader Pelosi has always enjoyed the overwhelming support of House Democrats and that will continue into the majority she’s so focused on winning," he said in a statement. "Democrats don’t let Republicans choose our leaders." This entry was posted in Politics and tagged 2018 Election, Nancy Pelosi, Politico, Tim Ryan. Bookmark the permalink.